The codex (our modern form of book) is first found in the first century CE. It was favored for early Christian texts. I wonder if the triumph of the codex format over the scroll/bookroll is a result of the fall of the Roman Empire and the arrival of the “Dark Ages”. One can imagine enthusiastic Christian communities sheltering their scriptures from the depredations of the Vandal hordes, going to lengths which librarians might be less ready to do. Had they not done so we might today be printing our books on web presses without the need for any folding or binding. Just chop them off and roll them up. 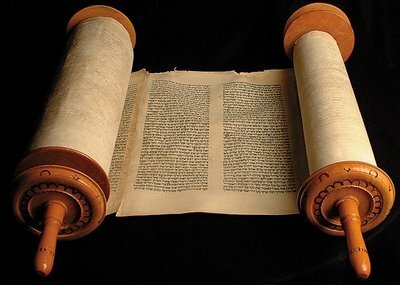 It’s perhaps a little paradoxical that the bookroll, superseded by one religion, is now most familiar from its appearance in the synagogue.